Lexington, VA -- Flatpicking guitar phenom Larry Keel dazzles music-lovers once more with his 15th self-released album Experienced, due out February 26, 2016. The album is an entirely original work that showcases both Larry’s and bandmate Will Lee’s exceptional songwriting, singing and jaw-dropping instrumental performances, accompanied by Keel’s equally talented wife Jenny Keel on upright bass and harmony vocals. It was recorded at Wally Cleaver Studio in Fredericksburg, VA with engineer (and guest drummer) Jeff Covert and mastered by the award-winning industry great Bill Wolf (Willie Nelson, Tony Rice, Doc Watson) in Arlington, VA.
Clarkesville, GA -- Larry Keel a musical icon and makes a rare tour stop in North Georgia this February. He has absorbed the best lessons from his Bluegrass family upbringing, both sides deeply steeped in the rich mountain music culture and heritage of Southwest Virginia. From there, he has always integrated that solid musical grounding and natural-born talent with his own incomparable approach to flatpicking the guitar and composing original music. He’s also got a knack for choosing interesting and appealing material from all realms of music with guts, whether it’s a tune written by a fellow song-writer/musician friend, or a tasty cover from any number of genres all over the map. 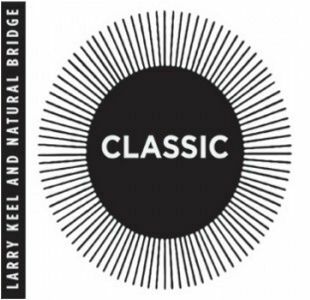 The highly anticipated studio project from master flatpicking guitarist Larry Keel and his powerhouse ensemble Natural Bridge has finally been unveiled. With these gutsy tracks Keel and his ultra-talented progressive string band have crafted a body of work that's original, fresh and new to the world of Americana and Bluegrass music. 7 of the 10 compositions on Classic are written variously by Keel, his band mates or by close musician-song-writer friends. The overall result is a recording so full of raw spirit, grit, wit, soaring vocals and jaw-dropping musicianship that it's easy to see why guitar icon, Tony Rice calls "Larry Keel...a force to be reckoned with."